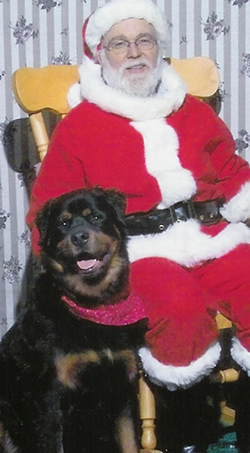 In April of 2002 we lost our most beloved friend, an 8 year old Rottweiler, name Goliath. It was a very difficult loss. On the morning of Nov. 24, 2002 we received a call from my sister-in-law telling us to turn on channel 30’s Sunday morning show. They were featuring the Granby Animal Control Officer with a dog from the Berlin Dog Pound, a Rottweiler they had named Goliath. We had 2 dogs already and had no intentions of getting another dog but there was something about this dog that I could not shake, so off we went “just to look”. When we got to the Berlin pound we were told Goliath was found roaming the streets, they had held him for 4 weeks and even with all the advertising no one claimed him. Because he was such a nice dog they where trying the TV. He was very thin, about 2 to 3 years old, neutered and with long hair, not very common in Rottweilers. The thing that touch my heart the most were his soft, gentle eyes and the way he was interacting with a small child that was there at the time. I could not leave without him but I did need to change his name. After 24 hours Bear had been accepted as part of the family. Bear did show some signs of abuse, however, ducking and flinching when legs were crossed or hands were raised. Running away when food was tossed or a ball was thrown, but never showing any sign of aggression or loss of the desire to be with people. We took a few classes at Tails-U-Win to strengthen our bond and gain his trust, he passed his Canine Good Citizen test and went on to take the Therapy classes from Tails Of Joy to see if our bond had grown enough for us to work as a team. We passed the Delta test in the fall of 2004, started visiting an assisted living facility and alzheimers unit that same year. After spending a morning with Deb Richards from the Masonicare Partners, (doing evaluations) and a presentation given by Faith at the Tails Of Joy meeting, I found myself very drawn to the mission embraced by Connecticut VNA Hospice and Pedi-Pals programs. What I have found most impressive about Bear is his ability to adapt his demeanor to the patient. If the patient is interactive, he will interact, if the patient is frail he will lie down quietly, if it is a child he will lay down or sit and except petting and giggles, and if a healthy adult he will lean and be openly affectionate. He seems to know instinctively what is appropriate for that patient. Claire and BearWe have been together for 8 years; I have tried to give him the loving home he deserves. He has seen me through the death of a family member, and the sudden tragic death of 2 other pets, but mostly has given me the honor of taking part in a program that without him was just a daydream. Bear retired from Hospice work as of November 2009 due to his advancing age and arthritis. I felt it was time to give him a life of couches, soft dry green grass and warm days of love and comfort. I have come to love this dog. His unconditional love and wonderfully gentle heart have been a blessing. I pray that God will give us many more years of soft wet licks, gentle soft eyes and the silly dance he does, the happy life that Bear deserves. I really love this wonderful creature that God in his great love has given us charge over and hope I have been a good steward of that gift. On January 22, 2010 Bear was diagnosed with bone cancer. This is a very hard thing for me to be facing again so soon. For those who know Bear’s story and my relationship with him know what a truly wonderful creature he is. A breed that has always been known as tough, protective, fearsome and sometimes a dangerous breed. Tough despite being discarded and treated harshly he emerged unscarred. Protective, always watchful over the ones he loves and who love him. Fearsome, only to those who have never met him or had the chance to meet him and look into his soft eyes and see the gentle creature God created. And Dangerous, only to the fear and anguish faced by the patients he visited, and the lives he touched. There are those who say he is only a dog, but for me Bear is a gift. Like so many others, that God created to help us understand, kindness, devotion, loyalty, gentleness, forgiveness, and unconditional love, freely given. Maybe that is why Jesus chose to be born in a stable, surrounded by those who recognized the purpose and person that lay in that manger. Bear passed away on February 15, 2010. I miss my Dancing Bear.